If three non-collinear points are joined by a straight line, then the closed figure formed is called a triangle. In the above figure, the three points A, B and C are not collinear, i.e. do not lie on a same straight line. The figure formed after the three points are joined by a straight line looks like the above one, a Triangle. A triangle is a closed figure. The three straight lines AB, AC and BC are called sides or arms of the triangle. 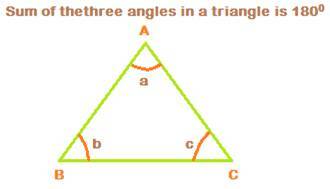 So, a triangle has 3 sides all of which are 3 different straight lines. The three points A, B and C of are called Vertices. Also, a triangle has three angles, formed at the three vertices A, B and C.
The three sides and three angles of a triangle are called parts or elements of a triangle. Interior of, On and Exterior to a triangle. In , point x lies inside the triangle. All of the space within the three sides AB, AC and BC form the interior region of the triangle. In , point y lies on the side DF, or the triangle DEF. a + b + c = 1800. Consider the following triangle ABC. Extend side BC upto point D.
Then an angle at vertex C is formed. It is angle ACD. 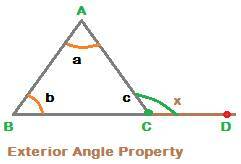 This angle ACD is called exterior angle for triangle ABC. Let x denote angle ACD. form a linear pair of angles.